Wise Grab-and-Go Gourmet Food Kit - 60 Servings | BUDK.com - Knives & Swords At The Lowest Prices! 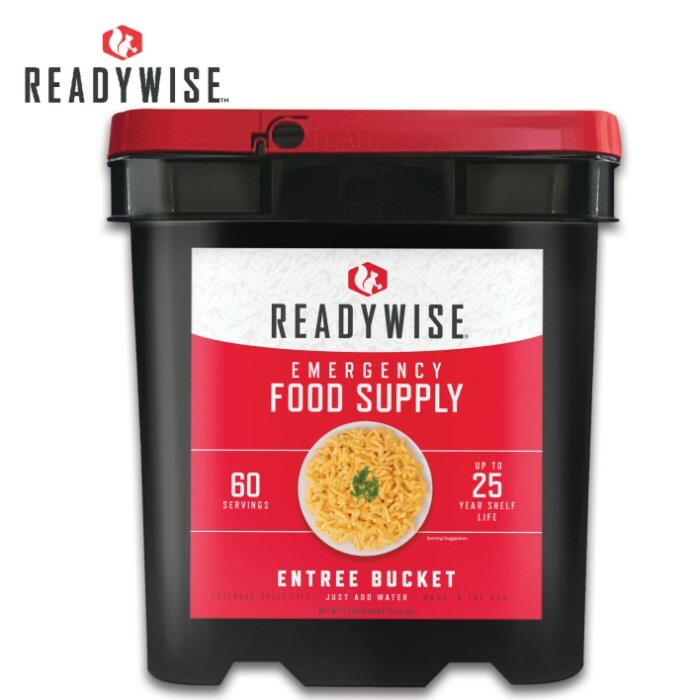 Enjoy 60 servings of hearty, nutritious and delicious entrees with this Wise Food Company Grab-and-Go Gourmet Food Bucket. 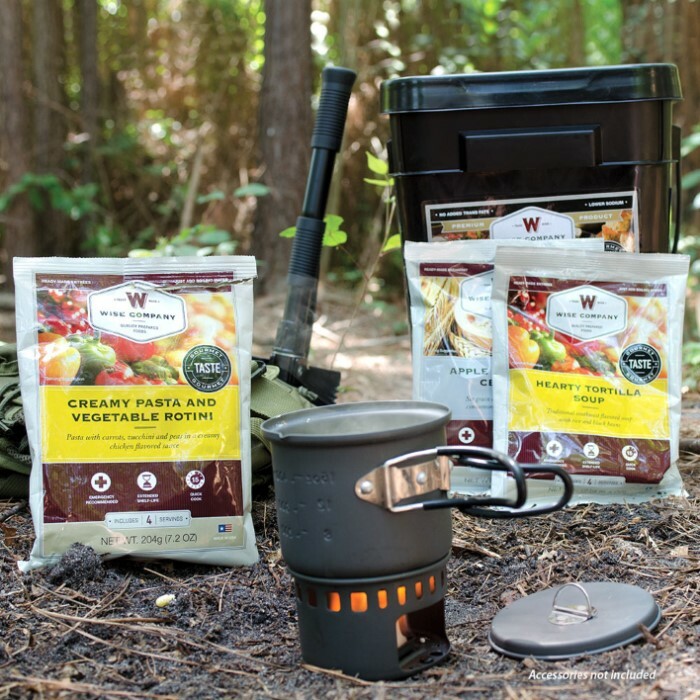 Each meal is made up of both freeze-dried and dehydrated components sealed in Mylar pouches. 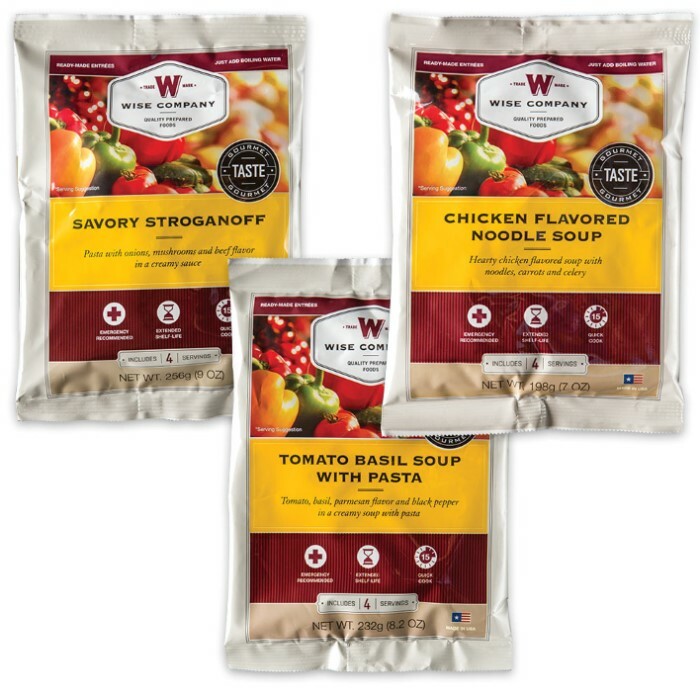 Simply add water and heat to enjoy the delicious ready-to-eat meal! There are two servings per day (entrees only) for one adult for a month or four adults for a week. These entrees have a 25+ year shelf life and are made in the USA. The bucket contains a variety of meals including savory stroganoff, pasta alfredo, chili macaroni, teriyaki rice, creamy a la king and rice, creamy tomato basil, loaded baked potato casserole and creamy vegetable rotini. RECEIVED IN 3 DAYS, TASTE WAS UNBELIEVABLE! MY 81YR. OLD MOTHER LOVES THE TASTE AND THE EASE OF PREP N EAT. BEST PRICE FOR THIS PRODUCT! ORDERING MORE FOR GENERAL FOOD USE, THE TASTE IS THAT GOOD! Happy that I found this here. Great product, great price!